Thank you to all who took part in the Oxford Big Sleepout this year. The night went really well, with music, soup and a screening of the film ‘Not Just Homeless’. Although there was fun to be had, spending a night out under the stars with only a sleeping bag and some cardboard for shelter, was not easy or pleasant. Everyone really got into the spirit of trying to understand what it might be like to spend night after night like this on the streets of Oxford. Thanks to everyone who came out on the night, or supported us in the run up to the event. Overall the Sleepout has raised over £22,000. A truly astounding amount, especially for the first year. We hope that you will join us next autumn… watch this space! This new event is organised in partnership with Aspire Oxford, Oxford Homeless Pathways and Connections Floating Support. All funds raised will be split between these charities and will go directly towards helping local people affected by homelessness. The Oxford Big Sleepout will give you a unique insight into the realities of homelessness. While this event will be in a safe environment for one night only, hundreds of local people have nowhere safe to go – this is their reality, night after night. The Sleepout will be on Friday 28th October at Hill End Outdoor Centre, starting at 7pm and running through until 7am the following morning. During the evening we’ll have live music, speakers and a cardboard shelter competition where you can create your own shelter for the night. At 10pm we’ll ask you to find somewhere to bed down for the night armed with just warm clothing, your sleeping bag and your cardboard shelter. We’ll then have hot drinks available in the morning and you’ll be able to leave by 7am. Oxford is facing a homelessness crisis. The number of people sleeping rough is increasing by 50% year on year. On top of this, the vital work of the leading homeless charities in Oxford is under intense pressure. Cuts of up to 65% could see charities forced to cut services, leading to more local people vulnerable to homelessness or insecure housing. We believe that now is the time to act. 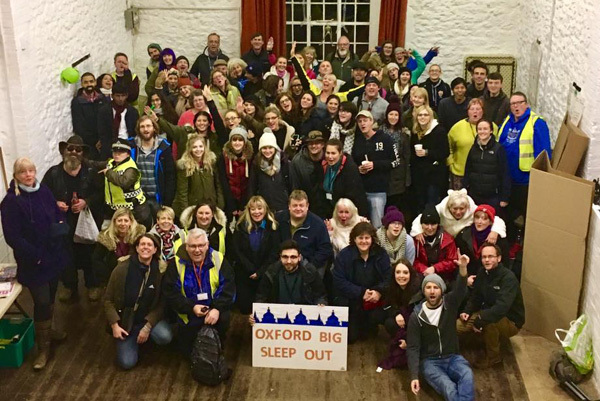 By signing up for the Oxford Big Sleepout you will be helping the most vulnerable people in Oxford to access secure housing, work experience, education and employment. Registration costs just £10 to help cover the event costs. We are asking people to raise at least £100 in sponsorship to help local people put homelessness behind them for good. There are also a limited number of tickets available for the evening only.